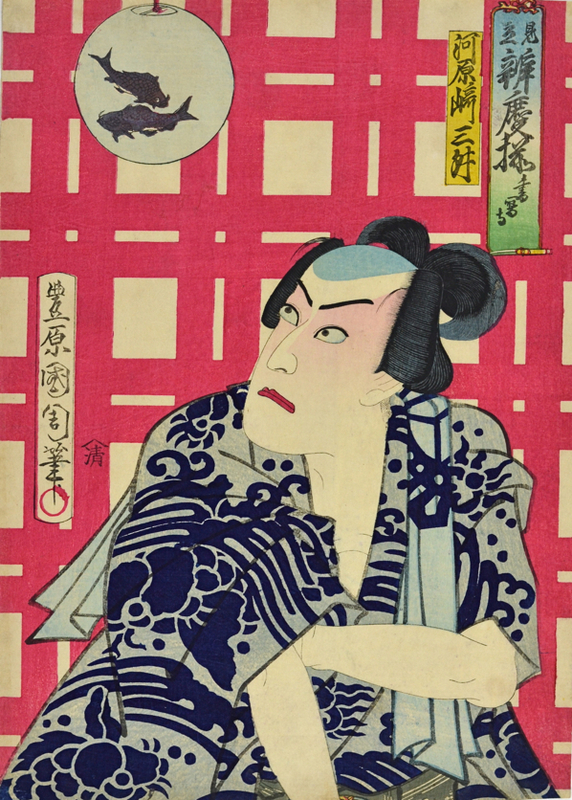 Toyohara Kunichika (1835-1900) Benkei Fashions Parodied: The actor Kawarazaki Sansho, 1872. Oban. Here is the actor Kawarazaki Sansho, who was to go on to become arguably the greatest kabuki actor of all time - Ichikawa Danjuro IX. As Danjuro, he and Kunichika would forge a great personal and professional alliance that was to rescue kabuki and revitalise it for the last decades of the nineteenth century. They were to die at the beginning of the twentieth century within three years of each other, kabuki having lost its vitality and popular importance. Here he is portrayed in the guise of the popular folk hero Benkei, loyal retainer of Minamoto Yoshitsune. In the violent upheavals of the Warring States Period in Japan from the mid-1500s till the early 17th century, there emerged a cult of young men eager to fight on behalf of unprotected, ordinary people. Such men, who were known as kyokaku or otokodate ("ones who seek to right wrongs") generally adopted the dress and imitated the behaviour of samurai. This series matches otokadate with episodes from Benkei’s life, satirising their styles and pretensions. In this print the paper lantern is decorated with a picture of carp swimming. Legend has it that Benkei was born with a full head of hair and a mouthful of teeth. He had extraordinary strength and was sent to be raised as a priest. One day he happened upon a giant carp at a waterfall and wrestled with it; on slitting it open he discovered the remains of his mother. Further reference is made to the giant carp in the stencilled pattern on the actor’s robes. The chequered background is in the colours often worn by Benkei and known as Benkei-jima. This is a great and well regarded series. The print is full sized and in a fine state. Very good colour and fine impression with embossing and delicate graduation of colour in the cartouche. This series is illustrated on page 100 of Amy Reigle Newland’s Time Past and Time Present: Images of a Forgotten Master, Hotei Publishing 1999.